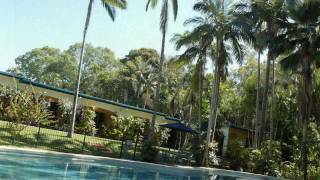 Villa Marine Holiday Apartments are located just 10 minutes from Cairns at Cairns favourite beach, Yorkeys Knob, famous for long sweeping tropical beaches and lots of wildlife. At Villa Marine there are apartments to suit all budgets, and they are just 50 metres to the beach and face the rainforest. The self-contained apartments have character and soul, some furnished with tribal and aboriginal artifacts. Villa Marine is famous for the unique rainforest they front onto and for the wildlife that visits, including kangaroos. It is a bird watchers haven with large numbers of rainforest birds, butterflies, and tree frogs. The holiday apartments are fully self-contained , and with only nine villas it is quiet and peaceful. There is a huge 18 metre lagoon pool. There are a variety of apartment sizes to suit singles, couples, groups, and families. Tours pick up at the door, there is an onsite tour office with free tour bookings and over 200 different tours to choose from, as well as car hire and local bus just a 50 metre walk; supermarket and cafes just a five minute walk away. Avoid the crowds of Cairns and stay by the beach. Experience rainforest, nature and serenity. Large units ideal for groups or families wanting larger accommodation options. These units are fully self-contained, air-conditioned, and have full cooking facilities. They overlook the private rainforest frontage. Ideal for singles, families and couples looking for very affordable accommodation. Fully self-contained with kitchen, bathroom, and patio overlooking forest. Fully renovated with new AUD3,000.00 bed. Beautiful views of rainforest from every window, separate from other villas. View wildlife from patio and bedroom window. There are two patios overlooking the rainforest, a new kitchen and appliances, new bathroom, new floors. A very beautiful setting.